Location: Entrance to Cold Spring Harbor, on a shoal 1500 yards off Centre Island. Description: Light 44 feet above sea level, fourth order Fresnel lens, fixed red light, concrete-filled cast iron foundation, square pyramidal wood tower. 1875, March 3: $20,000 appropriated. 1890, January 31: Began operation. 1913, October 19: Keeper Louis P. Brown arrived. Was keeper for 11 years. 1918, January and February: Ice repeatedly threatened the light. The ice caused grinding sounds, doors to be jarred open, dishes to be thrown from shelves, even extinguishing of light from vibration. 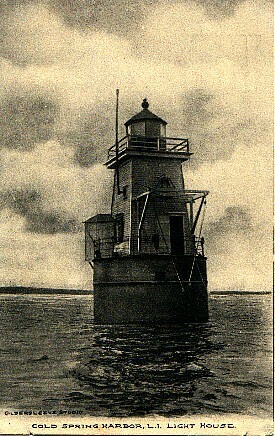 On February 19, Mr. Brown commented that the ice was making the lighthouse "sway, crack, and tremble tremendously." Inspection in the Spring found $12,800 worth of damage from ice. 1929: Light refitted with oil vapor lamp. 1965: Deactivated and relocated to private property on Centre Island. The surrounding area: Centre Island is on the west side of the lighthouse site, Lloyd Neck on the east side. The government originally wanted to put two range lights on Lloyd Neck, but could not procure the land. Other information: The base was a cast-iron caisson sunk 5 1/2 feet into the shoal. First keeper, William S. Keene, resigned after a month. When the light was deactivated, it was to be towed to Eaton's Neck and burned. A local resident purchased the light for $1 and had it put on her property, where it still resides.